Consider creating a list of strategic partners that will not necessarily attend your trade show, but will assist you in promoting it. For example, ABC Association cannot share emails with you, but is able to send out a blast to their contacts at no charge to you. And you in return for them. Your staff may be able to provides names you never thought of. 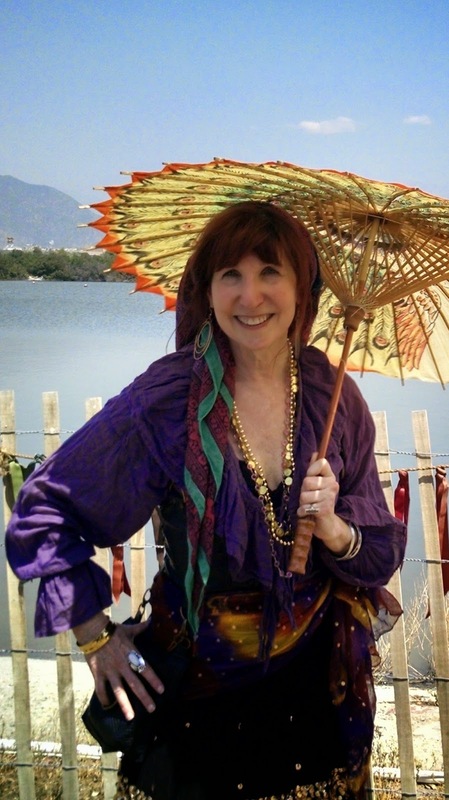 Contact Ruth Failer for other ways to promote your trade show attendance. See Tips of the Trade on Facebook for more tips and photos. Consider your target audience when you prepare your expo objectives before the show. It is best keep your objectives down to three. You may have many more, but the top three will guarantee your priorities are in order and keep your expectations in line. Do your research, it is possible you will have different objectives for different shows. Don’t stop marketing even when the expo has already begun. It’s easy to get into sales mode when the show opens, but what are you doing during your down time? 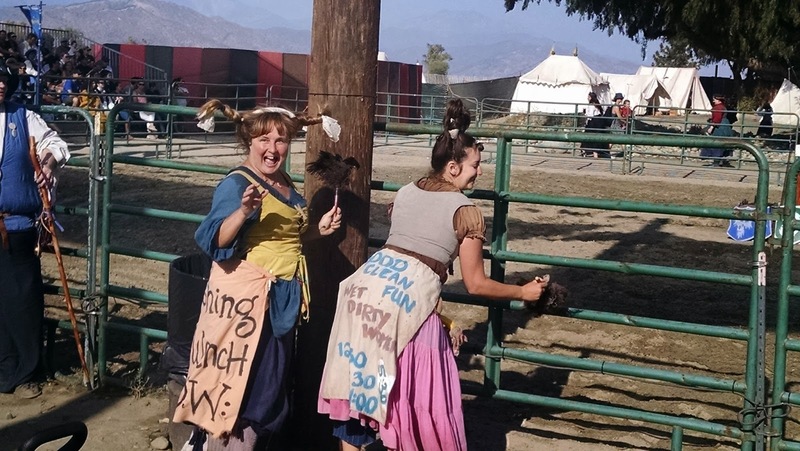 The Renaissance Pleasure Faire has different acts alternating on various stages. Towards the end of the day, we were watching people filtering in while waiting in the bleachers for the Fight to the Death Jousting Tournament. 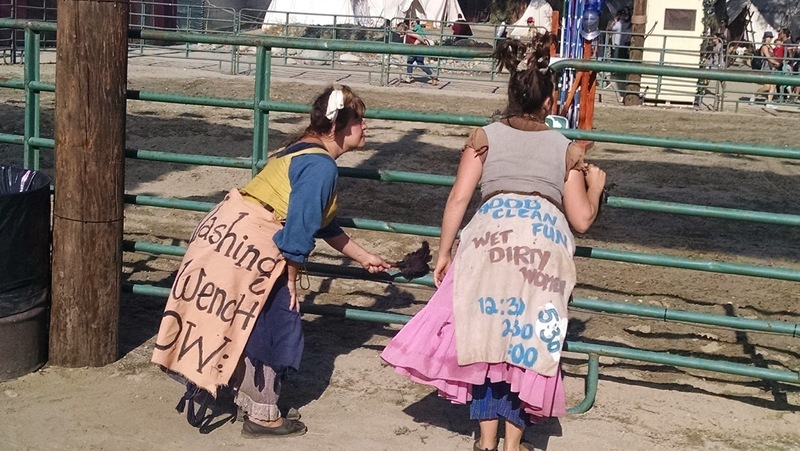 While everyone was getting comfortable two performers from another show known as the Washing Wenches walked around the outside of the jousting arena “dusting” the railing and interacting with audience members. What caught my marketing eye, were the large signs tied to their backsides indicating the times of their upcoming acts. Because of their presence we were suddenly reminded of their entertaining act and made a point to see their last show of the day. Very clever these wenches! Some expos close for education sessions or lunch and most booth staff will step away from their booth or have a shift change at various times of the day. What are you doing to keep your company on the minds of those who still have an opportunity to stop by your booth?